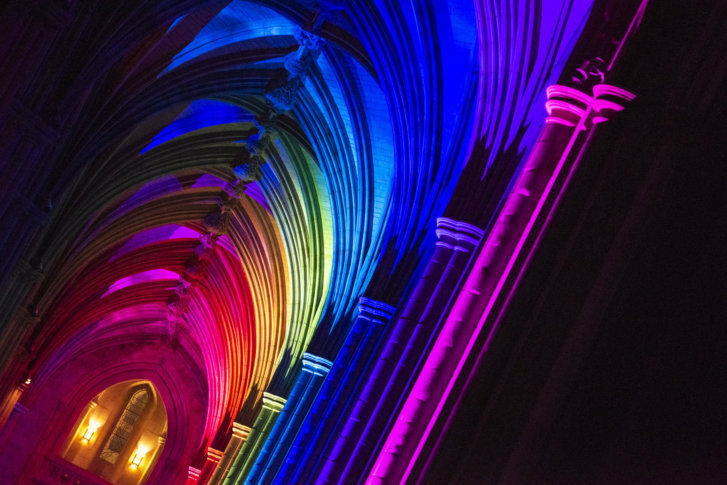 As if the Washington National Cathedral weren't gorgeous enough, moving lights bathed the Northwest D.C. church's gothic interior in a spectrum of color Monday night during an event called "Space, Light and Sound." See photos. WASHINGTON — As if the Washington National Cathedral weren’t gorgeous enough. The light show kicked off five nights of special events at the cathedral called “Seeing Deeper.” More than 3,000 chairs have been cleared from the central nave and “transformed into a community space,” cathedral officials said in a statement. Check out some of the sights from this week’s events in the gallery below. Upcoming events include an indoor viewing of the “Lego Batman Movie.” All money raised goes toward the cathedral’s general fund, which helps rebuild areas damaged by the 2011 earthquake. See more information about this week’s events on the National Cathedral website.